After the brutal death of her husband while the both of them were in bed together, psychologist Abigail Tyler (played by Milla Jovovich) decides to return her family to Nome Alaska for a fresh start. Things aren’t easy, her son has grown estranged from her and her daughter now suffers from conversion disorder, also known as hysterical blindness, as the result of witnessing her father’s death. Abigail hopes to just move past the tragedies in her life by burying herself in her work. An odd coincidence comes to her attention when several of her patients all claim to be seeing the same white owl watching them from outside their bedrooms in the middle of the night. Each patient is plagued by nightmares and Abigail decides to hypnotize one of them with disastrous results. After being forced to remember what has been happening to him the patient refuses to discuss it but later that night decides to murder his family and then kill himself. It is not until she hypnotizes another patient that Abigail begins to suspect what is actually going on in Nome Alaska. She begins to believe that the people of Nome and maybe even she and her family are being abducted by aliens. Of course the authorities don’t believe her, despite some rather convincing video evidence and she isn’t even sure herself until she hears a recording of herself being abducted. The recording, made while Abigail had fallen asleep while taking dictation, is filled with her screams of terror. It has also captured the strange voice of someone who is speaking what sounds like ancient Sumerian. Everything becomes far too real for Abigail when the police place her under house arrest sure that she had something to do with her patient’s murder-suicide. They also hold her responsible for her other patient breaking his back during a second hypnosis session, leaving him paralyzed. When her daughter goes missing and no one believes that aliens were the ones who took her, Abigail decides that she must go under hypnosis herself in an attempt to make contact with the aliens and get her daughter back. Set as a mockumentary, The Fourth Kind claims to be a recreation of actual events that had happened in Nome Alaska during 2000. Going so far as to show ‘actual footage’ of events side by side with the recreated scenes throughout the film as well as providing narration in the form of an interview with the ‘real’ Abigail Tyler the film goes all out trying to turn viewers into believers. There was even quite an elaborate viral campaign on the internet providing ‘real’ information as ‘proof’ of the films authenticity. I don’t have cable, which of course means that I can’t see movie trailers unless I go searching for them online. This means that I had little information on The Fourth Kind aside from the occasional bits found on the web. I didn’t even know about the viral campaign or that The Fourth Kind was being touted as ‘the real deal’ and I think this was a good thing. It seems that many viewers were angry that they had been ‘duped’ by The Fourth Kind and thought that what they would actually be seeing is actual footage of real alien abductions mixed into an authentic recreation. This of course makes me wonder if it has actually been that long since The Blair Witch Project, a film which also used the premise of being the ‘real deal’. In fact doesn’t anyone remember Orson Welles’ infamous radio broadcast of H.G. Wells’ War of the Worlds, a broadcast that many people believed was an actual news report about the Earth being invaded by Martians? Lets face it, if there was actual footage of people being abducted by aliens it’s highly unlikely that it would end up as part of a feature film. More than likely such footage would be confiscated by the feds and everyone involved would be ‘dealt with’. I rather enjoyed The Fourth Kind. Cleaver storytelling mixed with interesting blending of both ‘real’ and recreated footage, the film actually gives the feel that maybe, just maybe what the viewer is seeing could be true. It’s a movie that allows you to put away the skepticism for an hour and a half and just go with the flow. It doesn’t matter if the story is real or not, it’s entertaining and that’s enough for me. 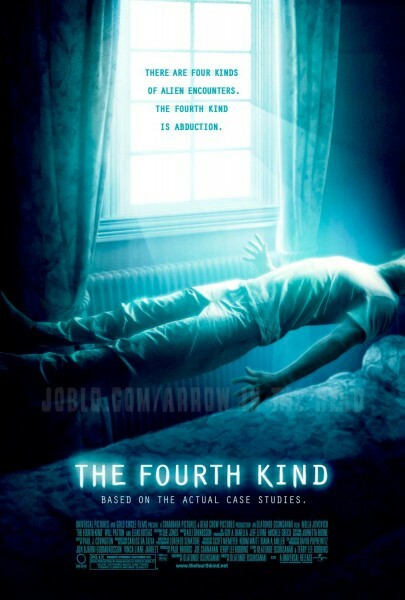 The Fourth Kind is now available on both DVD and Blue-Ray. For being an entertaining way to spend an afternoon I give The Fourth Kind four smiley guys.